Publisher's Special- limited time offer celebrating the upcoming release of Blood Bath, book 4 in The Maurin Kincaide Series. Vampires, witches and werewolves, oh my! Supernatural creatures abound in this slightly dark, action packed paranormal/urban fantasy series. Catch up on all of Maurin's adventures for just $0.99. 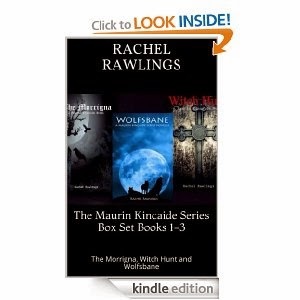 The Morrigna (book one)- Maurin Kincaide is a psychometric investigator for Salem's Supernatural Task Force. She's spent the last few years working crime scenes and using the memory links in fingerprints to catch criminals. When the current bad guy turns out to be a demon, Maurin must work with Seamus--the task force's prime suspect for unleashing said demon. She follows Seamus deeper into the supernatural community and discovers there's a lot more going on than anyone guessed. Witch Hunt (book two)- Maurin Kincaide is back in this action packed follow up novel to The Morrigna. No longer a member of Salem's Preternatural Task Force Maurin is the new liaison for The Council, governing body of Others. During what should have been a routine meeting with her former Captain, Maurin is brought in on a murder investigation. Three dead witches, three cryptic clues, no sign of the killers and the Salem coven is losing allies within the Council. If Maurin and her unlikely partner Captain Matthison can't stop the killers, the Witch City might be without its namesake. Given the choice between her sister's wedding and witnessing the challenge for Alpha of the Salem pack, Maurin knows exactly where she'd rather be. Smack dead center in a pack of snarling werewolves wearing eau de filet mignon. Until Francesca takes off the morning of her wedding. Being her sister's keeper will not excuse her from her job as the Council Liaison. Torn between obligations to a family she's avoided for almost a decade and the Council of Others, Maurin has less than twenty-four hours to set things right. A serial killer in Salem? Not for decades, but the bodies are piling up and all signs point in one direction. Rogue vampire. Except things aren't always what they seem, especially in a murder investigation. With her current relationship on the rocks, her father playing match-maker and her neighbor tossing his hat in the ring, the body count isn't the only thing on the rise. Maurin is neck deep in magic, mayhem and murder. <3 Thanks Patricia! You put a smile on my face!